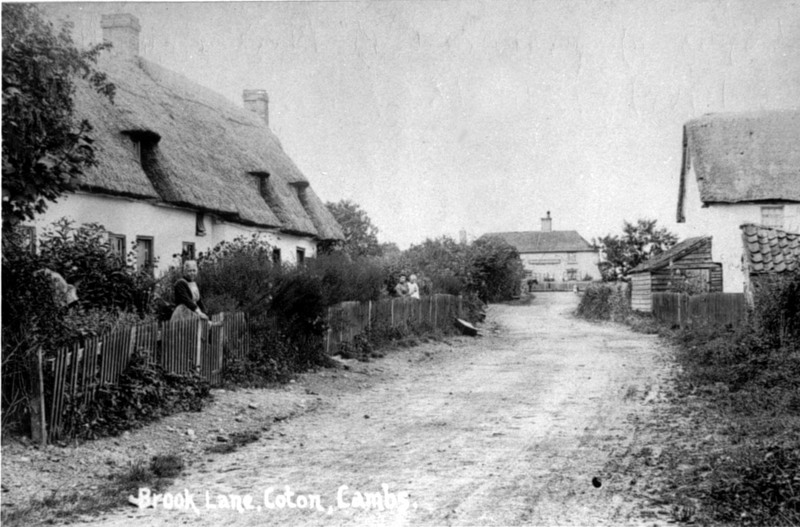 I was born at “HOPE COTTAGE .10 Brook Lane on 19-10-1937.The cottages had gone by then and the ROAD was better !!. The Plough of course was thewre .When was that built ?. Pity i did not have a love of Camerars when i was young. Not sure when it was built, but the licensed pub records go back to 1841, my Gt, Gt, Gt, Gt, Gt Grandfather Richard Scott was the publican……it remained in the family, which became the Edwards by marriage. Around about 1896 it transfered to the Childerley family, though my Gt, Gt Aunt Jane Edwards married Simon Childerley. Judging by existing parish & county records I would guess The Plough was built in the early 1700’s. Thanks for all the information Kevin.sorry i have just revisited the site. Happy New Year to all in COTON from Rex now living in Comberton. Soon i will have been there 50 Years ? .Where did they all go ??. My first home in Coton was a caravan sited just behind the Plough. My Dad, Les King, bought the caravan when we moved to Coton. I was about 2 years old. It had no electricity and lighting was from gas mantles supplied by bottle gas. At that time the pub landlord was Sid Childerley and it was a Flowers brewery tied house and very popular with the locals. We moved to a flat on Silverdale Avenue in about 1955 when I was five years old. Glad to see you on here .I worked at The Home Office along madingly road with your dad . Simon and Jane Childerley were my great grandparents. My grandfather, Douglas, was born in the Plough before he became the the village milkman. His brother Sid was the landlord for a time. I am the only Childerley still living in the village. My grandfather had many siblings, many of them spent their entire lives in Coton. I remember Doug well. He played in the village cricket team. Not a bad player as I remember. His brother Sid ran the Plough with his wife – I think she was called Doris. They had three daughters, Barbara, Joan ( who were a lot older than me) and Maureen, who was a couple of years younger. As I recall we were Chapel rather than Church goers. Is the old Baptist Chapel still there? Is it functioning? Every year the fair came to Coton and operated at the top of the Rec opposite the Plough. Sid did good business on those weekends. The fair connected to our Electricity every year .Wonder if that would be allowed now ? Does anyone know of the whereabouts of Barbara Childerley who lived at The Plough and went to the Cambridgeshire High School for Girls?